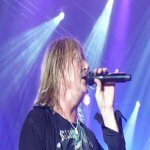 Def Leppard singer Joe Elliott was interviewed by Sean Knight for 93.7 KCLB radio on 5th May and the full interview audio is available. Joe talked about the shooting of 3 Down 'n' Outz videos in Sheffield, the second album The Further Adventures Of..., Slang Deluxe Edition, the 2015 studio album recording sessions, Summer Tour 2014, KISS, a possible opening act, touring the USA in 1980 and the Hysteria "In The Round" stage. Listen to the full 11 interview below. "We got together in February this year for a month half expecting to kind of maybe get three or four things on the go. You know, we're notoriously slow writers. And we have 12 cooking at the moment in various different levels of being finished. You know three of them, realistically three of them we could almost release tomorrow. The other nine or whatever it is they need a lot of work. We're gonna get together in the middle of this month until the end of May to do some more work and maybe even write more songs. And then after the tour that we do this summer with KISS we'll get back together and start finishing the album off. So we're hoping to have something together for I'd say like Spring time next year." "I'm really looking forward to it because both bands have got their full production. Both bands are playing for the same amount of time. It's like one and one makes three. I think for anybody that's buying a ticket to come along and see it. So see two bands with all those hits you know in one evening is - it's a special occasion. I'm a firm believer in rock shows being of that nature where you know when you get into the building the first band goes on and you actually know who they are and you know what to expect." "There's quite a possibility that there will be a third band on the Def Leppard/KISS tour but at this moment in time we're not really sure who it's going to be. But I mean the point is it'll be somebody that you don't know that well and that's giving a little bit back."